According to various Okinawan karate and kobudō sources the following can be said about the bō-kata called Tokumine no Kon. Tokumine no Kon is pronounced Tukunmī nu Kun in Okinawan dialect. The creator of this kata was Tokumine Pēchin Seifu of Shuri Gibo village. He was versed in both karate and bō, and besides was a calligrapher. While still living in Shuri, Motobu Chōki (1870-1944) was among his disciples and the following was handed down: Tokumine was inclined to extreme drinking and to drunk fighting. Chōki brought a bottle of sake to him as a lesson fee. But later one day, Tokumine was very drunk and behaved disorderly in Tsuji district. He had a big fight with dozens of chikusaji (policemen) to the point where they could not even stand up anymore. One person was seriously wounded. As a consequence, Tokumine was captured for interference with a public servant in the execution of duties and exiled to the remote island of Ishigaki where he remained until he died in exile. Since Tokumine Pēchin moved to Yaeyama, without noticing, the Tokumine bōjutsu in the Shuri neighborhood became extinct. In the early Shōwa era, Kyan Chōtoku (aka Chan Mī-gwā), who knew about Tokumine, went to Yaeyama to seek Tokumine no Kon as representing the core of Tokumine bōjutsu. But Tokumine Pēchin had already passed away. Fortunately, Tokumine Pēchin had taught his Tokumine no Kon to a village elder who was the owner of the lodgings he lived in and who cared about him. This man was Kedahana Gisa (1843-1934). Kyan Chōtoku asked him to teach him the bōjutsu and in this way he inherited Tokumine no Kon from Kedahana Gisa. The children of Kedahana Gisa said that he never taught bujutsu. 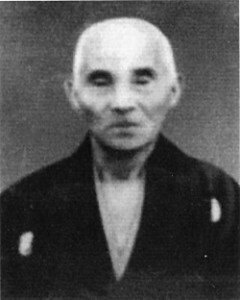 His son Hobuta (1882-1974) even went to Naha and paid a large amount of money to learn bujutsu from Tokeshi Ushinukajī. While Kyan Chōtoku declined to show Hobuta the techniques of the bō, he demonstrated the karate kata called Chintō for him. Kyan Chōtoku traded his own bō that he had brought from Okinawa with Hobuta’s favorite bō made of kuba wood. However, this memorable bō was lost in the war. Not long after Kyan brought back the Tokumine no Kon to Okinawa Main Island, this tradition was handed down in the Kadena area and also had a significant impact on the bōjutsu of the nearby villages. Tokumine no Kon is still handed down today. Currently, Tokumine no Kon does not exist anymore in Yaeyama. Technical features of Tokumine no Kon are the frequent use of nuki-waza, tsuki-waza, renzoku-uke-kōsei. The performance lines use offense and defense in all eight directions (happō). The above combined sources include Nakamoto Masahiro’s research carried out in Yaeyama in 1976. At that time he interviewed the Kedahana family, from whom the Tokumine no Kon is said to have come. According to the above karate kobudō sources, the reason why Kyan went to Yaeyama was to learn Tokumine no Kon from Tokumine Pēchin. According to the above texts, a Tokumine bōjutsu already existed in Tokumine’s Shuri days, with Tokumine no Kon described as the core of it. It is also said that Tokumine bōjutsu went extinct both in Shuri as well as in Yaeyama. Different terminology is used here which makes the matter quiet obscure. When do we find the expression Tokumine no Kon used for the first time? I do not have an exact answer, so let’s look up sources. Tokumine as a person first appeared in Funakoshi‘s article “Okinawa no Bugi” (Ryūkyū Shinpō, January 17, 1914), yet only the family name without any further reference to the kind of martial art nor to the person or anything else. In the summer of 1929, Miki Nisaburō and Takada Mizuho from the Karate Kenkyūkai of the Tōkyō Imperial University went to Okinawa. Kyan was among the first karate masters at the time from which Miki received personal instruction. When in 1930 the results of their study was published (Kenpō Gaisetsu), in Chapter 1 of the attachment labelled “Bōjutsu”, the authors introduced nine different names of the extant kata of bōjutsu, but Tokumine no Kon was not among them. In “The Masters of Modern Times”, the authors introduce thirteen masters from about three hundred years ago to the date of era of publishing, but Tokumine was not among them. As the authors not only talked to Kyan himself, but also to Ōshiro Chōjo and Yabiku Mōden, who were the two established authorities on bōjutsu of Okinawa at that time, it is reasonable to assume that by 1929 Kyan had not yet learned Tokumine no Kon, and that this very name of the kata not yet existed. In Nakasone Genwa’s: Karate-dō Taikan of 1938 another list of ten bōjutsu kata of Okinawa handed down appears, but again Tokumine no Kon is not found among them. When Nagamine Shōshin in 1976 wrote about Kyan’s performance during the Nagamine dōjō opening in 1942, he referred to the performed technique simply as bōjutsu, and not as Tokumine no Kon. At the same time he referred the karate kata demonstrated by Kyan as Passai. This makes the strong impression that by 1942 Tokumine no Kon as a common name for a kata was not yet in use. Taira Shinken in 1964 lists eleven kata “still extant today”, but Tokumine is not among it. It should be noted that among the supporting members of Taira’s association at that time where Nagamine Shōshin, Shimabukuro Tatsuo, and Shimabukuro Eizō, all students of Kyan. In addition, Shimabukuro Tatsuo incorporated a Tokumine no Kon into the syllabus of his Isshin-ryū. Two years later, in a film shot by Steve Armstrong in 1966, Shimabukuro Tatsuo performs a kata referred to as Tokumine no Kon (in katakana writing). This might be the earliest written reference to this name. However, this is a very different kata when compared to the ones performed by Nakazato Jōen, Shimabukuro Zenpō of Seibukan, and Toma Shian. It lacks the signature techniques and enbusen shown by the others and at the same time clearly features very different signature techniques instead, as well as a different enbusen. So there are two different kata that bear the same name. In a printed matter I found the expression Tokumine no Kon for the first time in Inoue Motokatsu’s work (1972), followed by Uechi Kanei’s work (1977), the BRD (1978); Aoi Umi (1978); ODHJ III (1983), and so on. So it became a more established name by the 1970s. When did Kyan Chōtoku learn Tokumine no Kon? There seems to be no source that even gives an approximate year as regards when Kyan went to “Yaeyama” to study the bōjutsu of Tokumine. The various Okinawa karate and kobudō sources don’t tell much about Kyan’s visit to Ishigaki. What they do tell is that Kyan went there to study Tokumine no Kon, or Tokumine bōjutsu for that matter. In addition, Kedahana Gisa was identified as the person who taught it to Kyan. Yet it is still unknown when Kyan Chōtoku visited Ishigaki. But here are some clues. In August 1930, Kyan, 60 years old at the time, together with Kuwae Ryōsei and Kudaka Masayoshi, went to Taiwan where they gave a special martial arts demonstration at the Taipei International Budō Festival held at the Taiwan Butokuden. During the festival, Kyan was matched against the jūdōka Ishida Shinzō. So it is possible that he first visited Ishigaki on his return trip from Taiwan to Okinawa. While there is no proof for the above theory, there are at least three newspaper articles from the year 1931 that report of Kyan Chōtoku’s visit to Ishigaki Island. According to these articles, Chōtoku was introduced as the “Ryūkyū karate authority” who came to Ishigaki to teach karate on the rather special occasion of the establishment of a “training facility” for karate, which we later find described as the “Southern Islands Butokuden”. As the first of these articles is from September 1931, and the last one from early December 1931, Chōtoku either stayed in Ishigaki for about four months, or he visited Ishigaki at least twice within this timeframe, meaning of course that he might have returned to Okinawa in between. 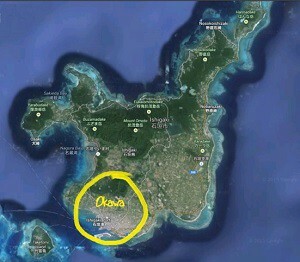 Location of the Okawa area on Ishigaki Island. On September 14, 1931, Chōtoku, 61 years old, gave a performance of karate at the Yaeyama Hall in Ōkawa on Ishigaki Island, and another one at the same place was scheduled for the following day. The people of Ishigaki were asked for their sympathy towards the establishment of the “karate training facility” which was repeatedly referred to as the “Southern Islands Butokuden”. Instruction in karate by Chōtoku took place from 8 to 11 a.m. and from 7 to 11 p.m., with a membership fee of two yen. The admission fee was devoted to help cover the construction costs of the Southern Islands Butokuden. Newspaper companies of Ishigaki further sponsored a charity demonstration meeting in aid of the Southern Islands Butokuden, for the opening of which “Mr. Kyan Chōtoku gathered the youth of the island for diligent instruction.” The charity demonstration began on December 7th, 1931, and continued every day for the course of one week. The performances started at 7 p.m. at the “Banzai Office”. Anyway, the above informations point to the year 1931 as the year that Kyan learned Tokumine bōjutsu from Kedahana Gisa on Ishigaki. Another question is: when was the kata actually named as Tokumine no Kon? We have seen earlier that by 1929 Kyan obviously did not yet learned the kata. In addition, Tokumine no Kon was first found described in a private film shot by Steve Armstrong in 1966, and in printed matter in 1972. At the time when Kyan Chōtoku went to Yaeyama, there seems to have been no name of a kata. Still in 1938 it was not found among the names of Okinawa kata of bōjutsu, and still in 1942 Kyan’s performance was presented under the generic name of bōjutsu, and Nagamine would surely have noted if Kyan had announced it in a more specific way. The given history strongly suggests that this bōjutsu only later became known as Tokumine no Kon, in the sense of constituting what was understood as the core of Tokumine bōjutsu. Like in many other cases of kata a retrospective naming seems to have taken place to honor the source of the tradition. And again like in many other cases, it probably was not even a fixed kata, but simply a collection of techniques of bōjutsu. See Kyan Chōtoku no Sai, Kanegawa no Tinbē, Kanegawa no Nichōgama, and probably many more which were created from a collection of techniques and retrospectively baptized under these names. Even at the point when it had become an actual fixed kata, it might have not yet been labelled as such. Shimabuku Tatsuo is said to have initially referred to Hama Higa no Tonfā simply as tuifa. He also initially called Kyan no Sai and Tokumine no Kun simply sai and bō. At the time of Kyan’s visit to Ishigaki, Kedahana Gisa (1843-1934) was in the advanced age of 87-88 years. If Kyan would have come to Ishigaki just a few years later, Tokumine no Kon might not have been transmitted to today, but instead would have become be a “phantom technique” (maboroshi no waza). Well, Kyan is said to have been taught bōjutsu by Kedahana Gisa (1843-1934), the master of the house Tokumine Pēchin lived in after he had been banished to Ishigaki Island. Because Kedahana is a family name from the village of Miyara on Ishigaki, it seems that Tokumine Pēchin had been exiled to Ishigaki Miyara village and that Kedahana Gisa there took care of his everyday life. 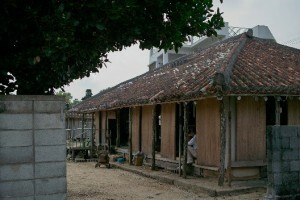 During the Meiji era, the Kedahana family was the first family who built a house with a tile-roofing in Miyara. During the Pacific War it served as a quarter for the officers of the troops that were stationed in Miyara. This first tile-roofing house of Miyara still remains today, and is the house where Hiroshi Oji (grandson of Gisa) has been living with his wife. And other than the karate kobudō sources claim – i.e. that there was no bōjutsu and that Kedahana Gisa’s son Hobuta never leaned any martial art from him – there are contrary records from Kedahana Gisa’s relatives. According to these, his son Hobuta as well as his grandson Hiroshi were in fact the masters of bōjutsu in Miyara village. Furthermore, there is family research on Ishigaki that does not support the story of exchange between Kyan Chōtoku and Kedahana Gisa. Instead, Kyan Chōtoku is said to have been “great friends with Acchi (=dialect for ojisan)”, which points to Gisa’s son Hobuta instead. And again this is the same Hobuta the karate kobudō sources claim had no knowledge of bōjutsu and bujutsu. There was a certain Nakachi (now deceased) and a certain Miyara who had received initiation into karate from Kyan Chōtoku in Miyara village. And there are also stories in Ishigaki Miyara village that relate to the tradition of Tokumine no Kon. Incidentally, in the Mura-bō (village bōjutsu) that has been handed down in Miyara there is a unique bō technique that is not found in other regions of the Yaeyama. It is a kata that is performed independently, not as a group kata. While the whole of the Miyara village bōjutsu itself does not have a name, the individual parts of it do have names. The kata in question is called Furi-bō. Well, it is not the same as Tokumine no Kon, but has points in common as well as differences with it. But it is a bōjutsu kata, and these always share techniques, though performed in different habits according to the various schools. 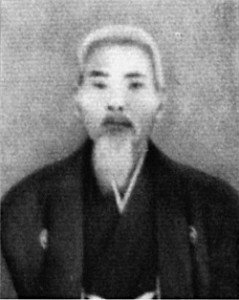 The 5th generation Kedahana Hobuta was Kedahana Gisa’s son, and his assistant and later 6th generation Daiku Gisa was Kedahana Gisa’s grandson. But Kedahana Gisa’s name itself does not appear in the genealogy of Miyara village bōjutsu. Other than it was stated in the karate kobudō sources as described in the beginning of this article, it became quite clear here that among the descendants of Kedahana Gisa were indeed experts of bōjutsu. It also became quite clear that this Miyara village bōjutsu on Ishigaki Island existed prior, during, and after Tokumine Pēchin’s stay on Ishigaki. Tokumura Kensho Sensei taught Tokumine no Kon to the Ishikagi Karate Association in 2014 and is actively researching Tokumine no Kon. Tokumura Sensei is a student of Shimabuku Tatsuo and was a friend to Nakazato Joen. 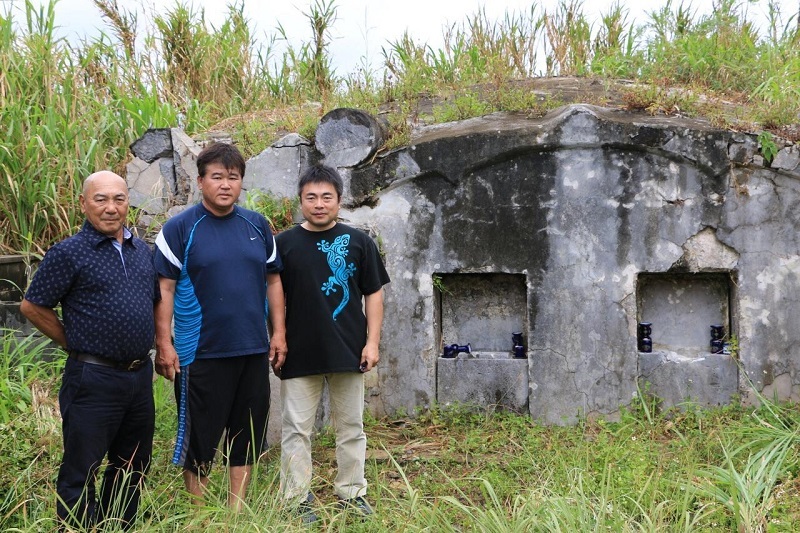 From left to right: Tokumura Kensho, Sadayoshi Kedabana, Keizo Nagira in front of the family tomb of the Kedahana family. Courtesy of Lars. F. Andersen. So, maybe there was more influence to Tokumine no Kon than the lineage Tokumine Pēchin→Kedahana Gisa→Kyan Chōtoku admits. Another question is if there was an actual Tokumine bōjutsu in existence in Shuri prior to Tokumine’s banishment, or if this is a theory from the karate kobudō circles only, based on the inference of the idea that Tokumine taught Kedahana Gisa, and that no one else on the island had any clue of bōjutsu, which as we have seen is not a fact. Let’s see if in the future more detail become known. Tokumine no Kon is also practiced as part of the syllabus of Isshin-ryū of Kyan Chotoku→ Shimabuku Tatsuo. While the previous three examples are the same kata, the Isshin-ryū version differs prominently from the previos ones. It lacks the signature techniques and has a different enbusen while at the same time clearly featuring quite different signature techniques as well as a different enbusen. I think possible reasons for this have been discussed previously by the experts of the style. Finally, here’s an example of Furi-bō from Ishigaki Miyara village bōjutsu, starting at about 2:22 minutes. Naturally, village bōjutsu follows very different demonstration habits when compared to kobudō bōjutsu. However, remember that the history of this village bōjutsu began in 1820, that it existed prior to, during, and following Tokumine’s time of banishment in Ishigaki Miyara. Would you ask me now which one influenced which, I couldn’t answer that. Note: A 1978 Aoi Umi article says the exact opposite: “In Yaeyama today still remains the kata of bōjutsu by the name of Tokumine no Kon.” It should be noted, though, that although various bōjutsu exist on Yaeyama, and specifically on Ishigaki, Tokumine no Kon was not handed down in Ishigaki by way of Kyan’s teacher. Possible reasons for this can be found in this article. This entry was posted in Bojutsu Kata Series, Kyan Chotoku, Unknown Ryukyu and tagged Ishigaki Miyara, Isshin-ryu, Kedahana Gisa, Kedahana Hobuta, Kyan Chotoku, Nakazato Joen, Shimabuku Tatsuo, Shimabuku Zenryo, Tokumine no Kon, Tokumine Pechin, Toma Shian, village bojutsu. Bookmark the permalink.